Claddagh brooch features a Connemara marble heart along with embossed detailing. 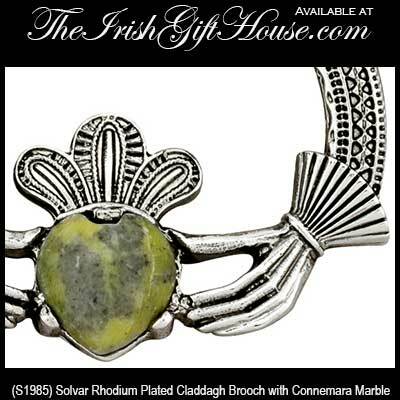 The Connemara marble that is featured in this Claddagh brooch is the only natural green marble in the world; fittingly, Connemara marble is only found in Ireland. This Claddagh brooch features inlaid Connemara marble along with a rhodium plated finish. This Irish brooch measures 1 5/8” wide x 1 3/8" long and it is gift boxed with Claddagh and Connemara marble history cards, complements of The Irish Gift House. 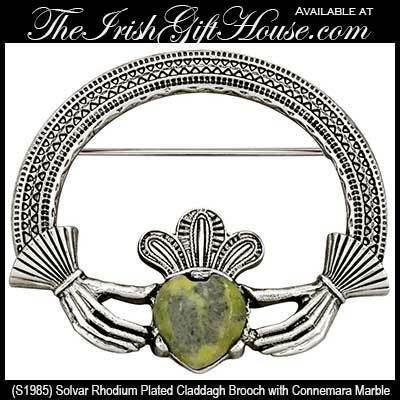 The Connemara marble brooch is made by Solvar Jewelry in Dublin, Ireland. This Connemara marble brooch, like all the Irish made jewelry at The Irish Gift House, is nickel free and hypoallergenic. Connemara marble accents this version of the Celtic Tara brooch. Celtic Tara brooch features inlaid Connemara marble stones along with an embossed design.